Much emphasis is put on the essay preparation for an MBA application. You need to highlight your achievements, career path and complimentary activities, the motivation to apply for that specific school, while highlighting what you want in future. These experiences then need to be packed into a strict word limit. As you start to write the essays, they seem unstructured – going back and forth searching for the right word that matches your story to the flow of the question and targeted programme. It takes time because it is also a soul searching exercise. While writing this blog, I looked back at the first question of my HEC essay. Regardless if it is a question included or not in an MBA application, I feel it is a question any applicant should answer and know by heart. Why are you applying to the MBA now? What is the professional objective that will guide your career choice after the programme, and how will it contribute to the achievement of this objective? My answer, which you can see below, described my professional career and how it helped shape my vision of business and management. It continued with reasons for an MBA to formalise my intent to move into senior management roles. For this part I highlighted: length, location, alumni network and specific professors. 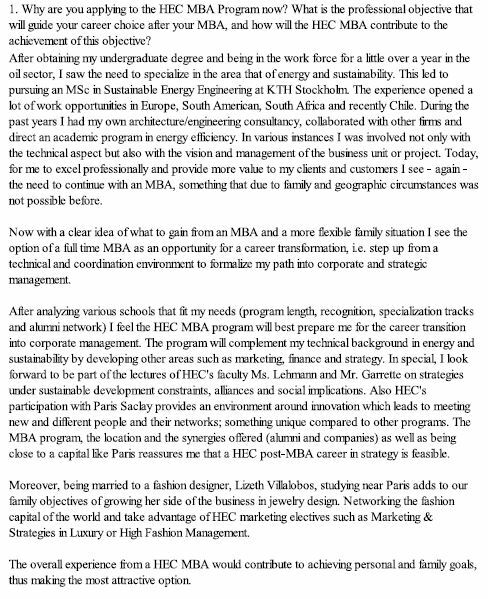 The fact that my family was joining me in this MBA adventure completed the final paragraph. Two years since writing the answer, more than 90 per cent is still valid, apart from the fact that I did not get to have classes with the professors I cited in my essay. Make it personal. Most questions target the professional development answer, nonetheless your life context, motivations and dreams should show through. Write and write, then trim. You will find yourself with several potential responses or examples to convey your potential. Let the ideas flow, rephrase if needed and then edit to highlight specific traits. Take your time. You need to reflect on past experiences and tie them in with the MBA to create a story for the future. At the same time, it is a piece of writing that helps to keep things in perspective once the programme is over. Prev Post: [MBA] How to make the most of your MBA internship, even if you don’t fit the typical profile (eg, 40 year old).